Interview with Author – James J. Rybacki, Pharm.D. You are here: Home / *Reading Room / Interviews With Authors / Interview with Author – James J. Rybacki, Pharm.D. JAMES J. RYBACKI, Pharm.D., was born in Oneonta, New York. He received his prepharmacy education at Creighton University and his Doctor of Pharmacy degree from the University of Nebraska Medical Center, College of Pharmacy, in Omaha. Dr. Rybacki has more than three decades of hospital and clinical experience that include early efforts in gas-liquid chromatography research characterizing human drug metabolites, and data collection for the College of American Pathologists to establish normal values for laboratory studies. Dr. Rybacki received the Early Lifetime Achievement award from the University of Nebraska College of Pharmacy in 2007. Rybacki is an active speaker on New Medicines and FDA approvals, Side Effects, taking your pills (adherence/compliance)and Medication Errors. He is the editor of www.EssentialGuideToPrescriptionDrugs.com and is a member of the clinical faculty at the University of Maryland School of Pharmacy and has provided clinical rounding and hospital experience for Pharm.D. and bachelor students. He presently teaches a Drug Information rotation for Pharm.D. students at The Clearwater Group. He is board certified in pain management at the Diplomat level by the American Academy of Pain Management, and provides ongoing clinical pain management, interim Hospital Pharmacy, Cardiology and Diabetes management and medicine information nationwide. Dr. Rybacki sits on the National Advisory Council of the Mended Hearts International (www.mendedhearts.org), is a member of The National Council of Hospice Professionals, the American Society for Preventive Cardiology and The National Lipid Association. Rybacki was actively involved in the post marketing monitoring of medicines via The Drug Surveillance Network, a nationwide association of clinical pharmacists, and he is an approved External New Drug Application reviewer for the Canadian Drug Ministry. He lives in Maryland. Dr. Rybacki’s efforts in drug information and clinical pharmacy include many years of active practice, including infectious disease, pharmacokinetic, nutrition support, pain management, and pharmacological consultations. Through an Occupational Health Unit, he has offered independent pain management and pharmacological consultations nationwide. He has also advised the World Health Organization’s Expert Committee regarding revisions as well as the selection of drugs to be listed in The Use of Essential Drugs and is an assistant editor for the Drugdex drug information system. His past role as a Vice President Clinical Services bought him added expertise in overseeing occupational health, physical medicines, laboratory services, imaging, cardiology, respiratory therapy, cancer programs, and continuing medical education. He served as conference coordinator for the first and second annual Dorchester General Hospital Pain conferences and as seminar coordinator for the eastern shore of Maryland for the “Take Control” physician and public pain education programs with Johns Hopkins. Dr. Rybacki is now president of The Medicine Information Institute–headquartered in Maryland. He provides drug information support and clinical pharmacy services to physician groups, consumers, and employers; holds seminars and continuing education meetings on diabetes, cardiovascular disease, infectious disease, adherence, osteoporosis, pain management, women’s health, and therapeutics; provides information support to insurance companies and HMOs; provides on-site hospital consulting on JCAHCO pain standards, optimizing use of medicines and other programs, produces educational tapes and television programming on medicines; designs clinical programs; conducts independent pharmacological evaluations and has most recently been the Health System Director of Pharmacy at the University of Texas Southwestern Medical Center. He served on the Patient Education and Professional Education Committees of the American Heart Association on a national level, was the first Pharm.D. Committee member of the American Heart Association Pharmaceutical Roundtable and is actively designing research involving how, why, and when to enhance the way people take their medicines and decrease risk factors for cardiovascular disease. He is a strong advocate of a multilevel/interdisciplinary approach to help patients get the most from their medicines and is designing projects to involve pharmacists/physicians/PAs/nurses/nurse practitioners/cardiac rehab programs at the practice site itself in helping patients and families understand risk factors, proven medicines and how to get the best results over time. Medicines and Your Family, National Treatment Guidelines was the first publication resulting from this novel focus and the second edition, Heart Attack transition was guest edited by Roger S. Blumenthal, MD and is now available on Amazon. He was selected for full membership in the American College of Clinical Pharmacy, is a Certified Clinical Densitometrist (CCD) through the Society for Clinical Densitometry, served a two-year term appointed by the governor of Maryland on a state-wide Osteoporosis Task Force in Maryland (see www.strongerbones.org). He is a lifetime member of Who’s Who in Global Business. Dr. Rybacki is director of clinical research, therapeutics, and outcomes at the Medicine Information Institute–an interdisciplinary consulting and education group. Dr. Rybacki has been a frequent guest on Comcast’s Family Talk live television program as well as their Real Life TV. He is now the writer and host of a patient education series called Medicines and Your Family with Dr. Jim Rybacki. You may have also heard him as the voice and writer of the Bayer Aspirin Pharmacist Report (a short-segment program on preventing a first heart attack). 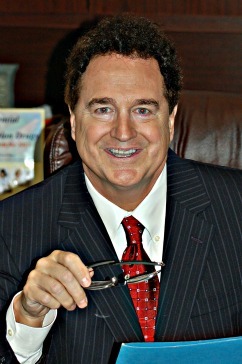 Catch Dr. Jim on TV, the Web, and on the radio (www.EssentialGuideToPrescriptionDrugs.com! Dr. Rybacki created a new book supported by an unrestricted educational grant from the Mended Hearts via Bristol-Myers Squibb/ Sanofi Pharmaceuticals Partnership. The book is called Medicines and Your Family, National Treatment Guidelines and has had more than 100,000 copies of the first edition given to heart patients and their families by The Mended Hearts, Inc. (www.mendedhearts.org). Dr. Rybacki thinks that the best colleague any doctor can have is a more fully informed patient. Dr. Rybacki brings late-breaking information to people via popular sites on the World Wide Web at EssentialGuideToPrescriptionDrugs. My father died from a side effect of one of his medicines. I think people should have the best chance to avoid potential problems by getting the most information possible BEFORE they start a medicine. I am driven in finding the best information, latest studies and superb guest editors for all of my Essential guide publications. The medicines themselves are in effect the “characters” in my books. They are all unique, but I don’t talk to them. I listen to the data published about medicines and use that to teach people and families how to avoid medicine problems. I literally was tapped on the shoulder by a colleague who knew Dr. Jim Long, MD. Dr. Long was looking for a strong colleague to take over the book. That colleague turned out to be me. He was the best mentor possible. I think there will be continue to be a balance of printed and electronic publishing. My personal focus will continue to be the guide, but this will be made stronger by evidence-based videos. I will start making these with colleagues very very soon!